I am sure you have heard of that rather amusing philosophical paradox, 'What happens when an irresistible force meets an immoveable object?' We obviously do not know the answer to that paradox, but not because of a lack of curiosity. Which leads me to query, what happens when a moveable object meets a resistible force? This is not a paradox; we actually do know the answer to this question. When a moveable object meets and greets a resistible force, a Nobel laureate gets dragged through the rotten filth of a muddy political arena. 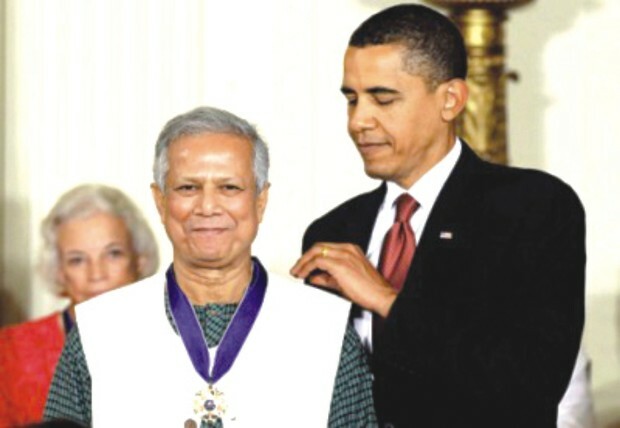 The Government's vindictive attempt to settle scores with our only Nobel laureate, Dr. Mohammad Yunus, is very unedifying and leaves an unpalatable aftertaste. There are many dimensions to this saga. The legal issues are under the consideration of the High Court, while the Government's political motivations are being prosecuted at the altar of public opinion, and rightly so. However, there is a third dimension to this drama that has not been highlighted so far. If the Bangladesh Bank performs a limited function in supervising an 'essentially government institution' such as the Grameen Bank, why did the Bangladesh Bank send a 'termination' letter to the Grameen Bank Board? Notwithstanding the limited authority vested in the Bangladesh Bank to supervise Grameen Bank, the Bangladesh Bank quite clearly had no problems with Grameen Bank's corporate governance practices over the past 10 years. So what has changed? Why is the Bangladesh Bank involved now? There is no need to speculate on why the Bangladesh Bank had a change of heart. Finance Minister Muhith, the all-extraordinaire communicator that he is, has already informed us that the Government had 'requested' the Bangladesh Bank to assess the legality of Dr. Yunus' continuation in his current position. 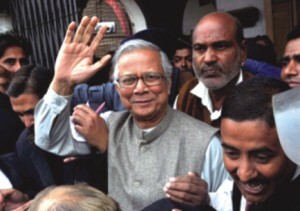 The Bangladesh Bank subsequently complied with the Government's request and issued a letter forcibly ousting Dr. Yunus. So what Government request will the Bangladesh Bank dutifully comply with next? If the Government requests the Bangladesh Bank to print money to pay for a large increase in public service salary, despite the inflationary pressures building on the economy, will the Bangladesh Bank comply? Will the Bangladesh Bank comply if the Government requests the exchange rate to be fixed at TK100 per US dollar to help exporters, at the cost of making food and fuel imports more expensive? Oh, here's a really good one! Will the Bangladesh Bank comply if the Government requests that Abdul Jalil, former general secretary of the Awami League, be fired as Chairman of the Mercantile Bank? In most economies around the world, there is a separation of powers between an executive body such as a Ministry of Finance, and an autonomous statutory body such as a central bank. The separation of powers ensures that no one public institution has a monopoly over the two main levers of economic policy, fiscal and monetary policy. Many economic studies have shown that the credibility of a central bank, derived from its effective and independent management of monetary policy, has a very significant impact on its ability to achieve low inflationary outcomes. And by the way, economic literature also overwhelmingly demonstrates that low inflationary outcomes are very important to achieve strong and sustained long term economic growth. Central banks, not unlike the judiciary, are designed to be immoveable objects. Central banks are vested with the institutional capacity to resist the political cycle-driven myopia of governments. And make no mistake about it, governments are not irresistible forces. That is why our constitution endows us with the right to pick up a pen in anger and express our thoughts. That is why you will have a chance to vote a ruling party out in parliamentary elections, if you should so choose. The Bangladesh Bank is endowed with equally effective powers to oppose the executive bully pulpit in the greater interest of the Bangladeshi public. The Bangladesh Bank, in complying with the Government's vicious attack on Dr. Yunus, has acted like a line ministry, not an autonomous statutory body. Its actions have diminished the public trust in its authority, and have desecrated its credibility to deliver on its mandate to maintain price stability, promote economic growth and job creation, and eradicate poverty. Nofel Wahid is a professional macroeconomist.